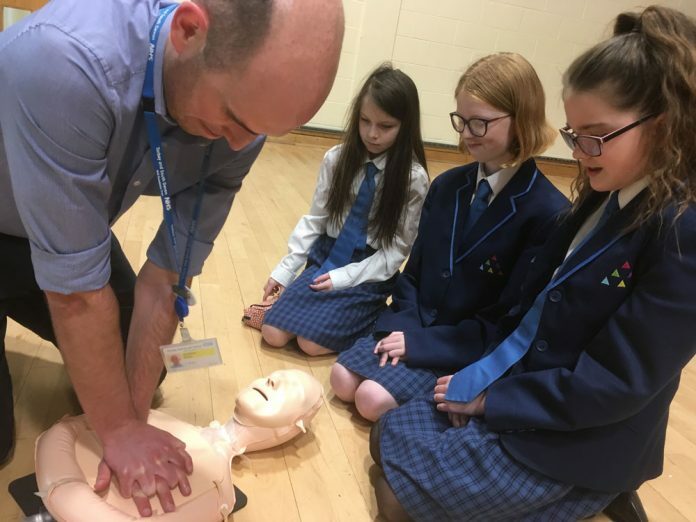 Spires College, Torquay and its pupils have been learning how to save lives thanks to the newly qualified doctors from the Torbay and South Devon NHS Foundation Trust. The #CPRinSchools project, teaches students the emergency procedure of cardiopulmonary resuscitation, or CPR to you and me. The very first school to benefit from the new #CPRinSchools was The Spires College Torquay where about 100 pupils aged 11 are learning how to restart someones heart on demonstration dummies. The class, guided by Dr Jon Sheen and colleague Dr Nicole Norman aims to give first aid skills to future generations, encourage closer working between healthcare providers and schools and enable healthcare trainees to expand their skills and confidence in teaching and leadership. #CPRinSchools is a fantastic national project, which we are proud to be the first team in Devon to roll out. It is proving popular in Torbay, where schools are fast taking up our offer to teach life-saving skills. “So far we’ve met with great enthusiasm from schools, teachers and more importantly the students. The children really grasp the basics of CPR and putting patients in the recovery position. This is a skill for life and a skill for saving life. You never know when you might need emergency life-support, and you can save a life at any age. Not only this, but the training is aimed at helping newly qualified doctors with their training. This is not only essential first aid for the children to learn, but also benefits newly qualified doctors like ourselves and colleagues who are taking part in delivering the teaching. #CPRinSchools is a national initiative organised for trainee healthcare professionals to teach CPR to children in schools. The project, #CPRinSchools, has gained significant support nationally from both senior and junior doctors including the UKFPO (the body responsibly for the training of newly qualified doctors), GMC and Royal Colleges.